The Fort Worth Country Day 2019 Fall Play is The Curious SavagebyJohn Patrick. This comedic story is one of the most beloved and produced high school plays of all time. The show is scheduled for October 26 and 27, 2019, with an understudy performance on October 20. Auditions will take place sometime in late April/early May.Audition information will be available on The Curious Savage group page on the FWCD website. Students interested in auditioning for the play should email Natalie Bracken ’05 to be added to the page. The Middle School Show Choir *CAST* recently competed at the Lone Star Show Choir Invitational. This year, the choir’s set was aptly named “Fourteen” – for the number of rehearsals in which the show was put together. At the competition, the show choir earned the People’s Choice Award and an Excellent Rating. *CAST* features 54 seventh- and eighth-graders and is directed by Middle School Choir Teacher Erin Ypya. Is there a correct answer in the Arts? The answer: not really. Let me clarify. We spend our time in the arts on a journey toward excellence. Do we ever get there? Not really, as creative beings are always looking for what comes next, how we could tweak something here or there to make it just a little bit better, and what we would do next time to take it to the next level. We are our own toughest critics. We hear the missed phrase; we see the missed light cue, the unrefined brush stroke. To the untrained eye, it is perfect and in many ways, it is. I know my parents would tell you that my second-grade art project was perfect -- and it was. It was perfect because the correct answer for my art was exactly what I wanted it to be. It was crooked; the proportions were off; the shadowing was basic; yet, it was perfect because it contained creativity. 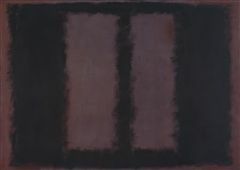 Pictured above: Untitled (Black on Maroon; by Mark Rothko 1958. 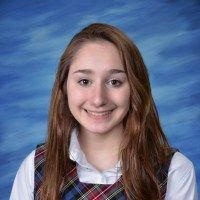 Grace Sapienza ’22 will soon see her play, Robert’s Rules, brought to life on stage. It was chosen for the Neighborhood Play Festival to be produced by Stage West in the Festival of the Kid this May. Paloma Casanova ’21and Pearce Wallach ’20 each earned Honorable Mention/Final Round for their respective plays, I'm Coming With You, and Accomplishing Something. For the Neighborhood Play Contest, North Central Texas area K-12 students were invited to pen a short play, scene, poem, monologue or prose for the Neighborhood Play Contest. Sample themes include culture, family, social issues, and life struggles or accomplishments. Up to 18 plays are selected to be staged and performed during Festival of the Kid in May. 2018-19 marks the 11th year for the contest, which is sponsored by the Stage West Patron Member group. Opening Night of Chicago High School Edition was electric! The musical, set in 1920s Chicago, features Roxie Hart (Jazmine Gomez ’22), who commits a murder and convinces her hapless husband, Amos (Austin Holcomb ’20), to take the rap ... until he finds out he’s been duped and turns on Roxie. Convicted and sent to death row, Roxie and another murderess, Velma Kelly (Claire Guthrie ’20), vie for the spotlight and the headlines, ultimately joining forces in search of the “American Dream”: fame, fortune and acquittal. Tickets remain available for the February 22 and 23 7 p.m. shows and February 24 3 p.m. show. All performances take place in the FWCD Scott Theater. Parental guidance is strongly suggested for Chicago High School Edition. This musical portrays murder, fame and 1920s Chicago. Not all themes are suitable for children. Read more about Chicago High School Edition in The Falcon Quill Article “What it Takes to Pull off ‘Chicago: High School Edition’” by Managing Editor Reena Alame ’20. Juniors Merrill Bumstead, Mia Fleischer and Sarah Hillebrecht w Juniors Merrill Bumstead, Mia Fleischer and Sarah Hillebrecht were honored at the Black & White Images Reception on February 2. Merrill earned third place for Pointe (Photo Essay); Sarah gained an Honorable Mention for Call for Help (Photo Essay), and Mia earned third place for Sand Dunes (Landscape/Cityscape). Sponsored by the FWCD Visual Arts Department, Black & White Images celebrated its 31st year were honored at the Black & White Images Reception on February 2. Seniors Peri Huling and Xitlali Castaneda and junior Mia Fleischer had work on exhibit in the first Dallas Young Artist Exhibition at Blue Print Gallery in Dallas. 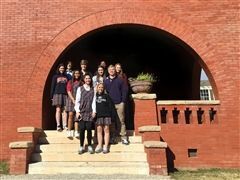 The exhibiting artists, their families and their teachers attended the opening reception on January 17 from 6-8 p.m.
Art History students took a special field trip on January 24: They toured the home of Brent Hyder ’69. The historic home, called Fairview, is located on Bryce Avenue. Hyder purchased the property and has been lovingly restoring Fairview since 2014. Fairview was built in 1893 by William J. Bryce, who served as the Mayor of Fort Worth from 1927 to 1933, and who desired to build “a fair home with a fair view for his fair wife,” Hyder shared on the field trip. 2018 marks the 31st anniversary of Fort Worth Country Day’s Black & White Images Competition and Exhibition. Sponsored by the FWCD Visual Arts Department, Black & White Images provides a forum for exhibiting student photographers from regional private and public high schools, allowing them an opportunity to exchange ideas, receive due recognition and display outstanding photography. Read more at Black & White Images. The Conservatory at Fort Worth Country Day is now accepting new participant registrations for the spring 2019 semester. In addition to private lessons in cello (grades K-12), violin (grades K-12) and guitar (grades K-12), we are proud to announce the addition of private voice lessons (grades 5-12) and private flute lessons (grades 4-12) to The Conservatory lineup.